184 pages | 7 B/W Illus. Narratives of Vulnerability in Museums is a study of the challenges museums face when they present narratives of instability, uncertainty and fear in their exhibitions. As a period of sustained societal and personal vulnerability, the Great Depression remains a watershed era in American history. It is an era when iconic visual culture of deprivation mixes in the popular imagination with groundbreaking government policy and has immense potential for museums, but this is accompanied by significant challenges. Analysing a range of case studies, the book explores both the successes and obstacles involved in translating historical narratives of vulnerability to the exhibition floor. Incorporating an innovative, trans-genre museological model, the book draws connections between exhibitions of history, art, and technology, as well as heritage sites, focused on a single era. Employing interpretations of housing, preserved and reconstructed, to discuss ideas of belonging and community, the book also examines the power of the iconic national story and the struggle for local relevance through discussions on strikes and industrial action. Finally, it examines the use of fine art in history exhibitions to access the emotional aspects of historical experience. The result is a volume that considers both how societies talk about less celebratory aspects of history, but also the expectations placed on museums as interpreters of the public narrative and agents of change. 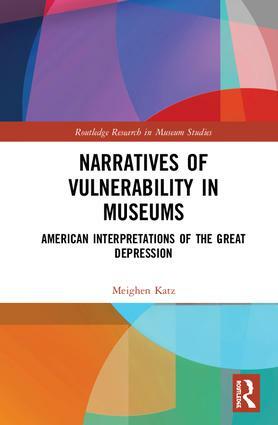 Narratives of Vulnerability in Museums makes a significant contribution to discourses of museum and heritage studies, of interwar history, of the social role of cultural institutions, and to vulnerability and resilience studies. As such, it should be essential reading for scholars and students working in these disciplines, as well as architecture, cultural studies and human geography. Meighen Katz has lectured at the University of Melbourne, Australian Catholic University, and Deakin University, and contributed to exhibitions at Museum Victoria, where she was the 2016 Grimwade Curator at the Ian Potter Museum of Art. She holds a PhD from Monash University, and is a founding partner of Present Past Consulting Historians.